The Samsung Galaxy E5 was another star from the Galaxy series with a 5-inch 720 x 1280 display. It boasted of a powerful 1.2GHz quad core processor. With 1.5 GB RAM and an 8 megapixel camera, it was a fairly decent catch at the time of release. Samsung Galaxy E5 ran on Android 4.4 KitKat and was powered by a 2400mAh non-removable battery. The phone was powered by a decent processor, though more powerful processors are available now of course. For a 2015 launch, it seems like a very basic phone when compared with the mammoths today. The camera, processor and storage capacity are outdated and those looking for upgrading their smartphone needs, must definitely sell this old phone. 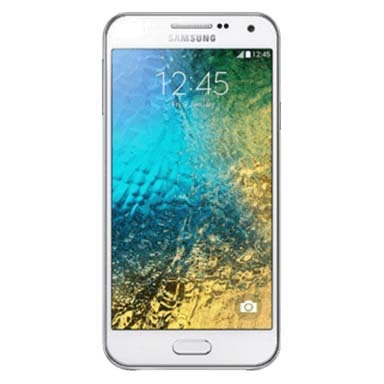 Made up your mind to sell your Samsung Galaxy E5 online? Cashify can handle all the problems related to the selling of your old phone and gadgets online with just a few clicks, giving the best prices in a short time with the least efforts. Cashify is all-in-one solution if you’re looking to sell old phones online. A trusted name with exclusive partners like Apple, Samsung, Xiaomi, and OnePlus, it offers complete assurance and safety when you sell old and used phones online. 1. Head over to the Cashify website and type your phone's brand and model name in the search box. Also, answer a few queries regarding the physical condition of your phone, warranty period, date of purchase etc. 2. Once done filling the details, Cashify will generate a transparent and fair price using your responses and the current market price of the model. This is done by using a proprietary pricing mechanism that is the USP of Cashify. 3. Assured about the price offered? Proceed to schedule a free pickup at the time and place that suits you. 4. A Cashify agent will reach you and pay you instantly in return for your old Galaxy E5. You can choose your mode of payment from options like e-wallets, cash, bank transfers. Cashify takes into account all the parameters and offers you the most competent price your old phone deserves. The entire process is foolproof and care is taken to ensure complete safety and convenience.